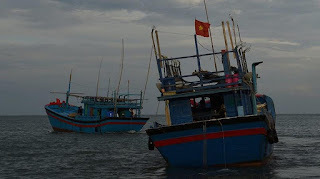 The 50 Vietnamese fishermen charged with illegally fishing in PNG waters have begun serving their four year jail sentences at Papua New Guinea's Bomana prison. Two boat operators were fined K50, 000 each and 48 crew fined K20, 000. According to Bomana Commander Vincent Kundi, the 50 have been integrated into the general population and have quietly begun their terms. He said the convicts have an ally in a Catholic nun who was brought in to translate for them and who has been assisting with the relatives of the 50 to pay the fines. "There is a language barrier that’s why the nun is assisting us. Right now there is no set time for the men to repay the fine, but we will take into consideration how long they served their time before they pay the fine. "The men have not complained about anything and so far they are handling the prison life very well," Mr Kundi said. The 50 have been fined nearly more than K1 million for illegally fishing in PNG waters. A total of 77 drums of bechedemer or sea cucumbers were found on board the foreign shipping vessels. The court found that the two operators without a valid and applicable license had harvested sea cucumbers.